INDIGO - indian food on the go is not just a restaurant in NOMA . This is a dream that we ‘TANDON’S’ are living everyday . We cannot be more proud of what we do in this 1000 square feet of INDIA that we created in Washington DC . Before being a brick and mortar at 243 K Street , NE INDIGO was a pop up stand that started in the North Hall of Union Station, Than to Georgetown University Market and finally established its roots in the Eastern Market . That 10x10 pop up tent was our dream coming true every weekend where people line up to enjoy the treats that we prepared for the weekend The meats and veggies sizzle on the hot grill authentically called ’The Tava’ filling the skies with wonderful aromatic flavors of Indian food. INDIROLL is everybody’s favorite treat . We got our platform and identity and love from the Eastern Market and we always want to stay loyal to the market . 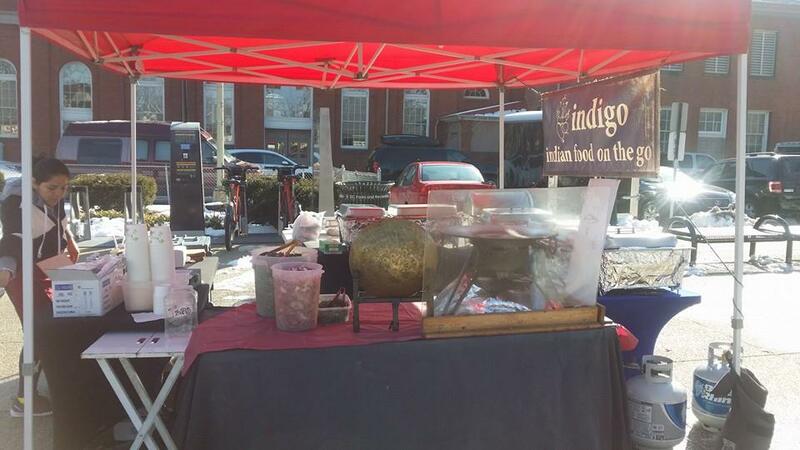 Indigo is still very proud to be a part of Eastern Market Vendor list for the weekends. Indigo is a family operated restaurant owned and operated by Nidhi and Dinesh Tandon. We are happily and lovingly married for 24 years now. 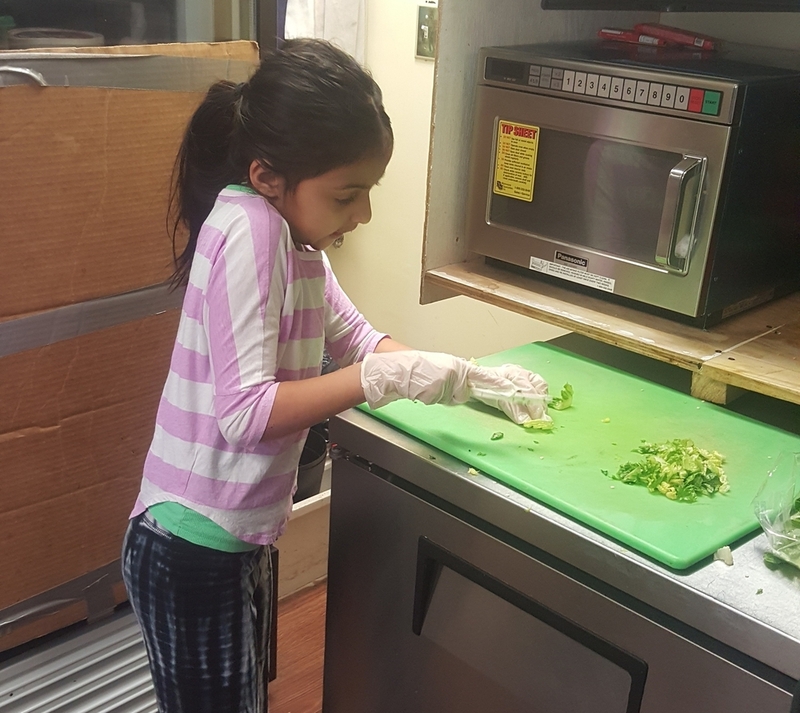 Grace , our youngest daughter , now 8 is the heart and soul of the restaurant. She can often be seen chatting around with people , running around with her friends from the neighborhood and is most pet friendly person. Our oldest son , Gorish 21, can often be seen behind the counter helping in the busy hours and our elder daughter , Garima who is 17 helps with our books and accounts . The market stall is totally taken over by our Nephew ARAV who is young and smart . All recipes are inspired from our mom's cooking who lives with us and you can often catch her talking a stroll around the restaurant and taking care of little Grace . This restaurant is totally run on the positive energy of all of us in the family . We live on top the restaurant and the restaurant kitchen is totally our house kitchen and the restaurant dinning hall is our family room as well. On Sundays the restaurant kitchen turns into the family kitchen and everybody cooks their own favorite meals . Over the period of 2 1/2 years we have grown into a staff of 18 people including 4 of us . This makes us a much bigger family now. We totally owe this to the amazing work staff that we have . We could not have made it up to here without them. We have people in our staff who have been with us since day 1. When we signed the lease in Aug’ 2013 we didn’t know what we are getting into. Moving from Virginia into Washington DC and stepping up from a pop up to a brick and mortar , big transitions and big move for the whole family seemed very difficult and we were very nervous . We had no idea how amazing our neighbors are . They made this transition for us so easy and amazingly comfortable . They welcomed us into the community and have helped us through thick and thin. We cannot be more proud to be a part of NoMa and to be in this amazing neighborhood. Indigo’s model is unusual like a restaurant because the idea is to make everyone get a feel of being at home while not actually being there . DC is over populated and more and more people are moving in leaving this city with not much of a choice but to come up with high rises . People are here for all over and everybody is amazingly hard working in their own way . We do understand it. There is not many patio’s in every house and not everybody has time to cook meals and have friends over all the time. So Indigo is the place . We wanted to create a place where people can enjoy all what they lack while at home. We want you to come in and get a feel of home , serve yourself with drinks , pour your own wine like you do at your house. Serve yourself with a beer like you would at home. Get your friends along and hang out on our patio as casually as you want to. Get home cooked meal everyday .We play different music videos , more bollywood because its more entertaining in its own way and we keep it loud so that when you are here you are not distracted with the stress from work anymore. Our patio is pet friendly and we love it when you can bring your dogs and other pets along. At Indigo you will get the most fresh meals everyday because our work model is such that we cook almost the entire menu everyday . Its all small pot cooking and we keep cooking over and over for backups as dishes keep getting sold. Whatever we eventually run out is erased from our chalk board menu which is uploaded everyday morning . WE LOVE WHAT WE DO AND WE HOPE THAT YOU ALL DO AS WELL .